Product - Mary's Gone Crackers Super Seed - Basil$ Garlic - Case Of 6 - 5.5 Oz. Mary's Gone Crackers Super Seed - Basil$ Garlic - Case Of 6 - 5.5 Oz. Product - Mary's Gone Crackers Super Seed - Seaweed And Black Seaseem - pack of 6 - 5.5 Oz. Mary's Gone Crackers Super Seed - Seaweed And Black Seaseem - pack of 6 - 5.5 Oz. Product - Mary's Gone Crackers Super Seed- China And Hemp - pack of 6 - 5.5 Oz. 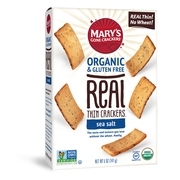 Mary's Gone Crackers Super Seed- China And Hemp - pack of 6 - 5.5 Oz.